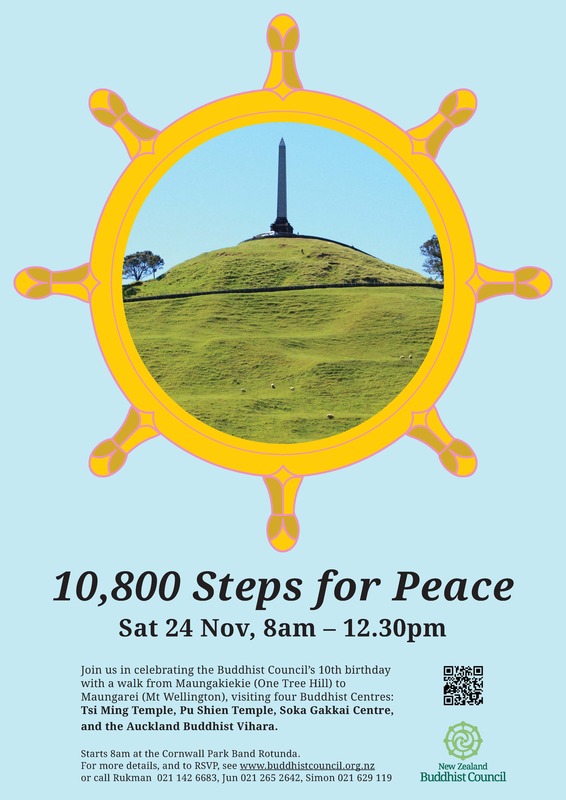 Join us in celebrating the Buddhist Council’s 10th birthday with a peace walk from Maungakiekie (One Tree Hill) to Maungarei (Mt Wellington), visiting four Buddhist Centres — Tsi Ming Temple, Pu Shien Temple, Soka Gakkai International NZ Auckland Centre, and the Auckland Buddhist Vihara. 10,800 Steps for Peace, Saturday 24th November. 8am. Auckland. When: Saturday 24 November, 2018. 8:00 a.m. to 12:30 p.m.
Light refreshments will be offered at Pu Shien temple. RSVP using this form or call Rukman 021 142 6683, Jun 021 265 2642, Simon 021 629 119. The principal objective of this event is to reflect and celebrate the links between Buddhist groups and their involvement in the wider community. The walk links two volcanic cones and four temples, representing significant spiritual communities in Tamaki Makaurau. It is striking that between just two of Auckland’s maunga, there are four well-established Buddhist communities. Lines drawn between other mountains would yield similar results. The walk is a chance for us to express our gratitude for the Buddha’s teachings, and for being able to practice freely in New Zealand, and to celebrate what we aspire to practice — ways of cultivating inner peace, kindness and wisdom. 8:00 a.m. Gather at Cornwall Park Band Rotunda, brief talk and orientation. 8:20 Walk via Atarangi Road gate to Tsi Ming Temple, Wairakei Street, Greenlane. 9:00 approx Offer incense at Tsi Ming’s Dizang Pusa figure or main altar. 9:30 Walk via Main Highway to Pu Shien Temple, Wilkinson Road, Ellerslie. 10:00 Offer incense at Pu Shien main altar, words from Abbess Master Chang Lin. 10:20 Offering food to bhikkhus and bhikkhunis, refreshments. 10:50 Walk via Gavin Street to SGI Auckland, Eaglehurst Road. 11:00 Introduction to SGI. Group Photo. 11:30 Walk to the Auckland Buddhist Vihara, Harris Road, via Ellerslie-Panmure Highway. 12:05 Gather around Bodhi tree. Final words from Ven. Amala and Ajahn Chandako. 12:30 Rides available back to Cornwall Park or optional ascent of Maungarei (Mt. Wellington). Optional: t-shirt or other garment identifying your group, flags or banners. Zero Waste: Please help us keep our city beautiful. Please avoid bringing items that cause waste, such as single-use drink bottles or packaging. We will be collecting litter on the way and will dispose of this responsibly. For planning reasons we need to confirm numbers, including the number of ordained Sangha attending. Confirm your attendance prior to 23 November. RSVP can be done by filling out this form here.